Sagina (saj-jye-nuh) Irish Moss, Pearlwort; Caryophyllaceae Family. Low, evergreen, moss-like herbaceous perennials from Europe. Often used to plant between stepping stones, in sun or shade. Sagina glabra (glay-bruh), Scotch Moss, forms a dense carpet to 4 inches tall and does well in sunny sites. Tiny white flowers appear in summer. Sagina glabra aurea (aw-ree-uh) has golden yellow flowers. Sagina subulata (sub-yew-lay-tuh), Irish Moss is a hardy perennial from Corisa. Well branched, with creeping stems, Sagina subulata forms a dense mat 2 inches thick. White flowers on hair-like stems 4-inches above foliage in July to August. With a soft, lush feel and appearance, Sagina will take light foot traffic when placed between stepping-stones. Sagina will occasionally form mounds, if overcrowded; to smooth out, dig up the mounded portion (divide to replant) and tamp down surrounding plants to cover the bare spot. Mow soon after flowering to prevent seeding. 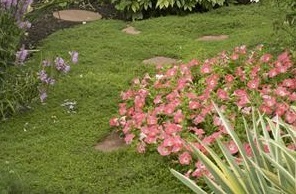 Excellent as a border plant, in container, for edging, ground cover, between stepping stones and mass plantings. Deer resistant.